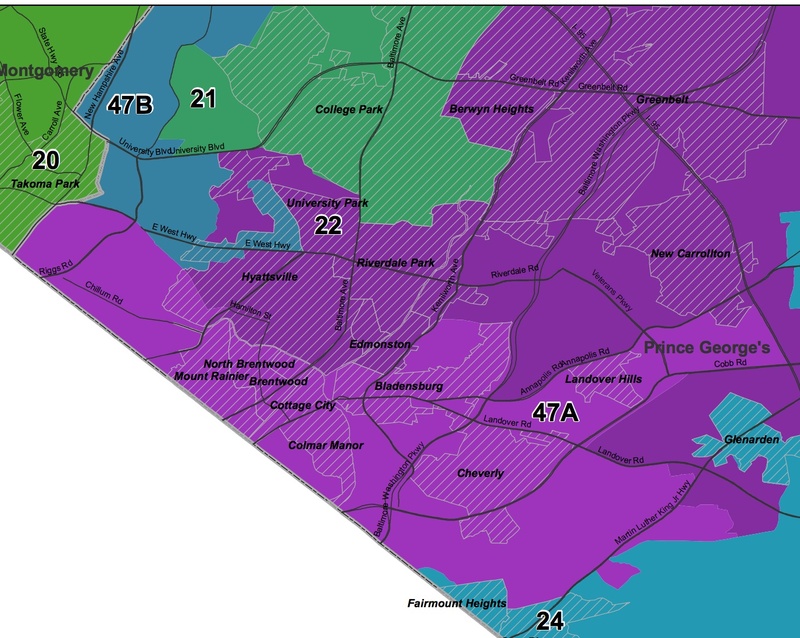 District 47 is a majority black district in Northeast Prince George’s County with an exploding Latino population. As of the 2010 Census, the voting-age population of the district was 50% African American and 37% Latino. Subdistrict 47A (two delegates) was 62% black while subdistrict 47B (one delegate) was 61% Latino. Two-term Del. Victor Ramirez ousted corrupt African-American Sen. David Harrington to become Maryland’s first Latino State Senator in 2010. Now, Ramirez faces long-time Bladensburg Mayor Walter Lee James. Ramirez has money ($122K while James hasn’t filed a financial report) and the power of incumbency. James has a strong base in Bladensburg that he’ll need to turn out in large numbers to overcome what are sure to be extraordinarily high percentages for Ramirez in Langley Park. But even that seems unlikely to be enough as Bladensburg composes just 7% of D47. James would need to somehow unify and rally African-American voters behind him to defeat Ramirez– very difficult without money against an active and energetic senator like Ramirez. Incumbent Mary Lehman is has no opponent in the primary or general election. She has already won. Doyle Nieman chose to avoid a tough member vs member fight brought on by redistricting by dropping down to run for the council seat left open by term limited Council member Will Campos (who is running for a legislative seat district 47). Neimman had roughly $27,000 in his campaign account as of the last filing. Doyle faces off with suicide prevention advocate Deni Taveras, who is slated with Senator Victor Ramirez. Taveras has roughly $16,000 in her account as of January. Nieman brings a powerhouse of resume and history to the contest. Taveras will benefit from the rapidly changing demographics in the district. The average Council race in Prince George’s runs $80,000-$100,000 so both have a lot of call time to do in the next few months. Eric Olsen is term limited. His Chief of Staff, Dannielle Glaros is running for the open seat. She faces mental health counselor Terence Collins and former New Carrolton City Councilman Jim Wildoner (who ran for this seat as a Republican in 2006). Glaros had $28,000 in the kitty as of January and should be a lock. Check back soon for profiles on races 4-9.